The Defensive Pistol (Expanded) class (NRA Defensive Pistol Course format) focuses on the information and techniques needed to develop a defensive mindset. 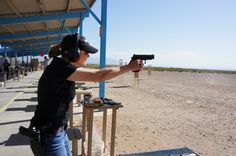 The goal of the course is to gain the knowledge, skills, and attitude necessary to carry and use a concealed pistol ethically, responsibly, and with confidence. The class is designed as a logical follow-up to the NRA Basic Pistol course. It is also an excellent class to prepare the shooter for the NRA Basics of Personal Protection Outside The Home course. A sampling of subjects that will be discussed are: Developing the proper mindset when using a pistol for personal protection, mental awareness and confrontation avoidance, principles of cover and concealment, drawing and presenting a firearm from concealment, clearing common stoppages, range training, and more.